Michael Schumacher, who won the F1 World Championship 7 times, was already an ambassador for Audemars Piguet since November 2010. 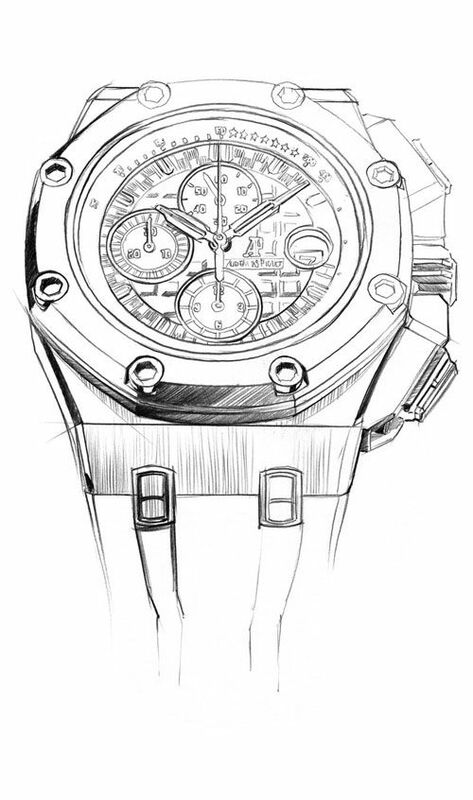 Today, almost two years later and in the 40th anniversary year of the Royal Oak, Audemars Piguet announces that Michael Schumacher gets his own Royal Oak Offshore Chronograph collection, linked to his name. Together with Octavio Garcia (who we’ve interviewed in Paris, click here to read it), Michael Schumacher was closely involved in the design process of his Royal Oak Offshore Chronograph. 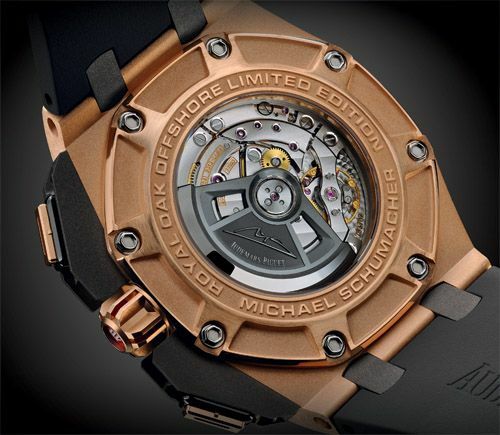 There are quite some interesting details about this watch that makes it Michael Schumacher’s personal watch. Besides the obvious 7 stars (for each World Championship) on the tachymeter (2 in blue for his achievements at Benetton and 5 in red for his achievements with Ferrari) you can see the minute track with this very cool chequered flag pattern and – perhaps even cooler – the hour and minute hands in the shape of a Formula 1 car’s monocoque construction. Last but not least, the winding and setting crown has the shape of a gear wheel. The crown has this red aluminum inlay with AP logo on top of it. As for the movement, Audemars Piguet took their chronograph movement that they always use in their current line-up of Offshore Chronograph movements. A piggy backed caliber 3126/3840. This means that the caliber 312x base caliber is used and a chronograph module (caliber 3840) has been added on top of it. This also explains the deep date aperture and why it needs a cyclops. This movement, that consists of 365 parts, has a personalized rotor with the engraving of Michael Schumacher’s signature. The 22 carat gold rotor has received this anthracite galvanic treatment to give it that sporty instead of classic look. The chronograph is being operated by two big square shaped pushers, something we prefer over the original smaller round pushers on Offshore Chronograph models. One other cool thing is that Audemars Piguet seems to have learned from complaints about the stainless steel and gold octagonal bezels, which happen to be real scratch magnets. 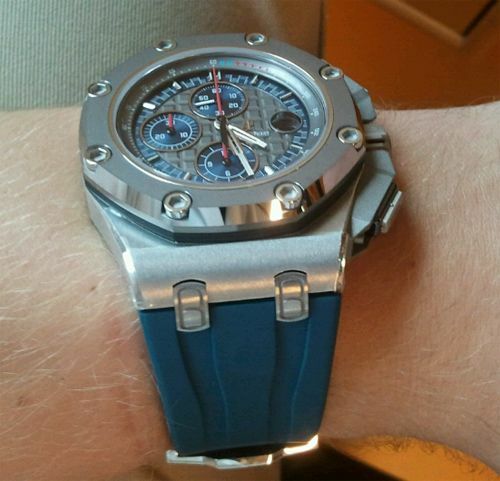 All three versions of the Schumacher edition of the Royal Oak Offshore Chronograph have a bezel made out of Cermet. According to AP’s press release, Cermet is seven times (can’t be a coincidence) more durable than steel. This should keep your bezel free of scratches and dents we hope. 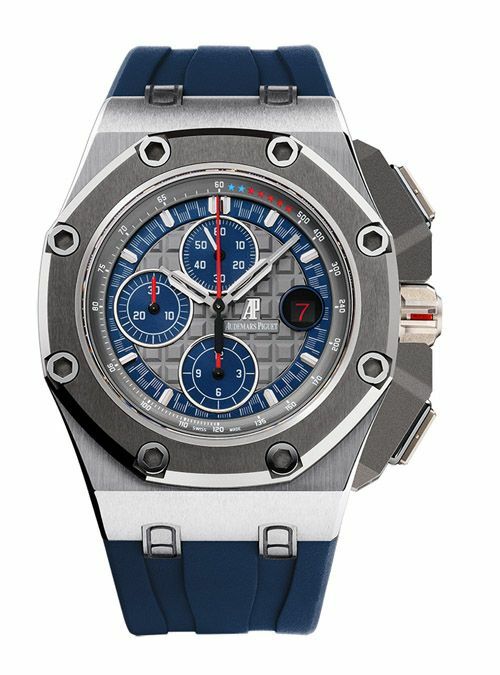 As mentioned above, there will be three versions of the Royal Oak Offshore Chronograph Michael Schumacher editions, each being limited in production numbers. The titanium version (ref. 26568IM.00.A004Ca.01) will be limited to 1000 pieces, the 18 carat pink gold version (ref.26568OM.00.A004Ca.01) will be limited to 500 pieces and the platinum Pt 950 version (ref.26569PM.00.A021CA.01) will be limited to only 100 pieces. The case diameter is 44mm, a tad bit bigger than the regular Offshore Chronograph models (‘Theme’ models are 42.5mm, click here) but just as big as the previous introduced new Offshore Chronograph models (click here).